The ANZAC War Memorial is located at the southern extremity of Hyde Park on the eastern edge of Sydney's central business district, and it is the focus of commemoration ceremonies on Anzac Day, Armistice Day and other important occasions. It was built as a memorial to the Australian Imperial Force of World War I. Fund raising for a memorial began on 25 April 1916, the first anniversary of the Australian and New Zealand Army Corps (ANZAC) landing at Anzac Cove for the Battle of Gallipoli. It was opened on 24 November 1934 by His Royal Highness Prince Henry, Duke of Gloucester. This image belongs to the travel and nature stock photo library. This stock photo of ANZAC War Memorial at Night is available for licensing for commercial and editorial uses including websites, blogs, books, magazines, brochures and advertising. Restrictions may apply for images which contain third party copyrighted material or sensitive subjects. Photos of artwork are for editorial use only. 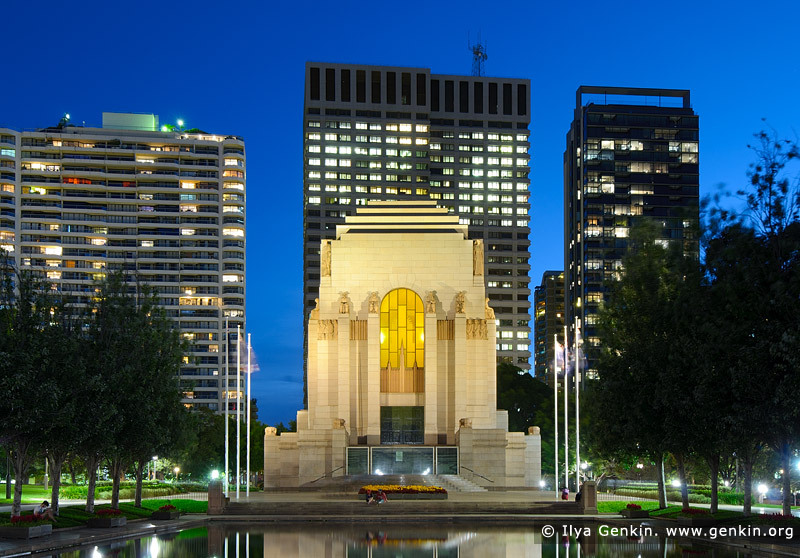 This image id AU-SYDNEY-HYDE-PARK-0006 of ANZAC War Memorial at Night, is copyrighted © by Ilya Genkin. This is not a public domain image.